What's important about the weather to you? For us, it's whether it's going to be wet or dry, sunny or cloudy, hot or cold, windy or calm over the next two or three days. That information's available on the BBC web site, and a host of others - but I want to have it to hand, as a graphic picking out the vital details, on our web site. The BBC lets us take and reuse the data (though not use their symbols, and we much mention them) ... and here is what I have come up with. The graphic on the right here is a demonstration that will NOT change - is shows some of the symbols, and the minimum (blue) and maximum (orange) temperature expected over a 24 hour period - in both Celcius (Centigrade) and Farenheit. Frosty blue and frosty orange are used instead if to show freezing point or below! I may come back later and add some sort of magnifier onto the temperature scale, as it's a bit compressed at the moment. 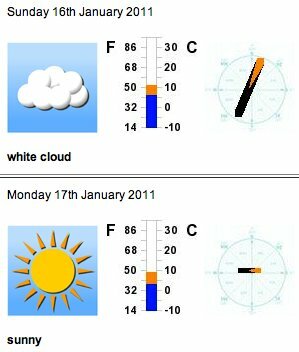 The wind indicator shows both the direction and strength - the length of the symbol being the strength, and the orange tip shows the way the wind is going. So for Sunday, the forecast is an average wind speed of 19 m.p.h, from the SSW (South South West) towards the North North East. By Monday, the widn speed will be down to 6 m.p.h., and it will be a Westerly wind.